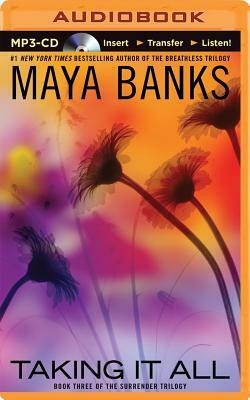 "Maya Banks...I'm ready for the next ride now " said USA Today. And now, Maya Banks is ready to deliver. From the "must-read author" (Romance Junkies) of Letting Go and Giving In--the new novel in her Surrender Trilogy. Chessy and Tate have been married for several years. In the beginning, their relationship was everything she wanted. Passionate. All-consuming. She offered her submission freely and Tate cherished her gift with a tenderness that made her feel safe. Content. Wanted. Loved beyond all measure. But as the years have gone by, Tate has become more immersed in making his business a success, and Chessy has taken a back seat to his business obligations. Growing unhappy with the status of their once blissful marriage, Chessy knows that something has to give, or they stand to lose it all. Tate loves his wife. Has always loved her. Providing for her has always been his number-one priority. But lately she's seemed unhappy, and he's worried. Worried enough that he arranges for a night together that he hopes will reignite the fire that once burned like an inferno between them. But a business call at the wrong time threatens everything. Chessy's safety, his concentration, his wife's faith in him as her husband--a man sworn to love and protect her above all else. Gutted with the realization that he's going to lose her--has already lost her--he readies for the fight of his life. Whatever it takes, he'll get her back, show her that nothing is more important than her love. And that if she'll allow him to prove himself one more time, he'll take it all. Everything. But he'll give back far more: Himself. His undying love.